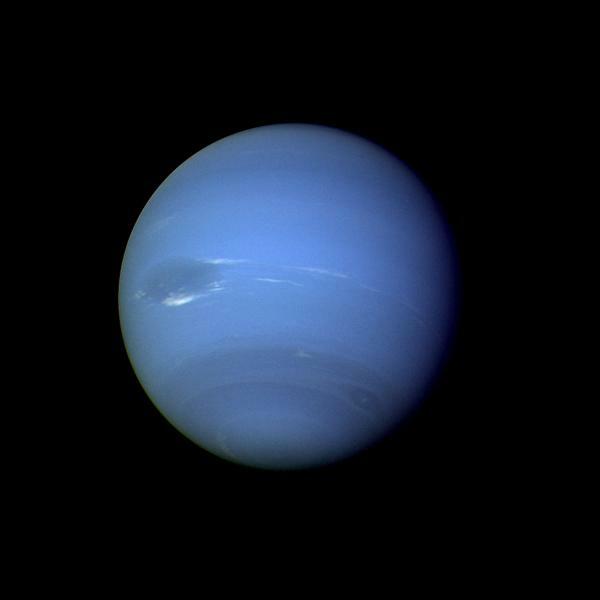 August 25, 2014 – Today marks the 25th anniversary of the historic encounter of NASA’s Voyager 2 spacecraft with Neptune and its planet-sized moon, Triton. The Voyager 2 expedition delivered the first close-up look at the unexplored planet. Voyager’s visit to the Neptune system revealed previously unseen features of Neptune itself, such as the Great Dark Spot, a massive storm similar to, but not as long-lived, as Jupiter’s Great Red Spot. Voyager also captured clear images of the ice giant’s ring system, too faint to be clearly viewed from Earth.Voyager scientists were also amazed to see that Triton has active geysers. Voyager 1 and 2 were launched 16 days apart in 1977, and at least one of the spacecraft visited Jupiter, Saturn, Uranus and Neptune. Voyager 1 now is the most distant human-made object, about 12 billion miles (19 billion kilometers) away from the sun. In 2012, it became the first human-made object to venture into interstellar space. Voyager 2, the longest continuously operated spacecraft, is about 9 billion miles (15 billion kilometers) away from our sun. The Voyager spacecraft were built and continue to be operated by NASA’s Jet Propulsion Laboratory (JPL) in Pasadena, California. The Voyager missions are part of NASA’s Heliophysics System Observatory, sponsored by the Heliophysics Division of the Science Mission Directorate. The Laboratory for Atmospheric and Space Physics in Boulder provided the Photopolarimeter System for the Voyager expeditions. By studying the data from this instrument, scientists gained invaluable information about the surface texture and composition of Jupiter, Saturn, Uranus and Neptune, along with information of size distribution and composition of Saturn’s and Uranus’ rings. It also collected information on atmospheric scattering properties and density for all planets. In a strange coincidence, the New Horizons spacecraft, which is the first mission sent to explore dwarf planet Pluto and the Kuiper Belt beyond, also crossed Neptune’s orbit today. Several senior members of the New Horizons science team were young members of Voyager’s science team in 1989. Many remember how Voyager 2’s approach images of Neptune and its planet-sized moon Triton fueled anticipation of the discoveries to come. They share a similar, growing excitement as New Horizons begins its approach to Pluto. The Johns Hopkins University Applied Physics Laboratory (APL) manages the New Horizons mission for NASA’s Science Mission Directorate; Alan Stern, of the Southwest Research Institute (SwRI) in Boulder, is the principal investigator and leads the mission. SwRI leads the science team, payload operations and encounter science planning; APL designed, built and operates the New Horizons spacecraft. New Horizons is part of the New Frontiers Program managed by NASA’s Marshall Space Flight Center in Huntsville, Alabama. New Horizons is the first mission in NASA’s New Frontiers program. The spacecraft is expected to pass Pluto at its closest approach next July.